HOTEL NEELAKANDA, faces the sea from every nook and corner. From every single inch of it. However you try, be sure, you will always get watched by the sea. At all times. 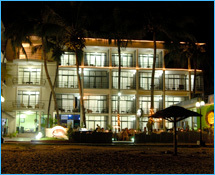 16Kms from Trivandrum airport,..
HOTEL MARINE PALACE is situated very close to the beach and offers a host of facilities for the most discerning tourist. Multi cuisine restaurant, deluxe AC and Non AC rooms with telephone, CCTV and r..